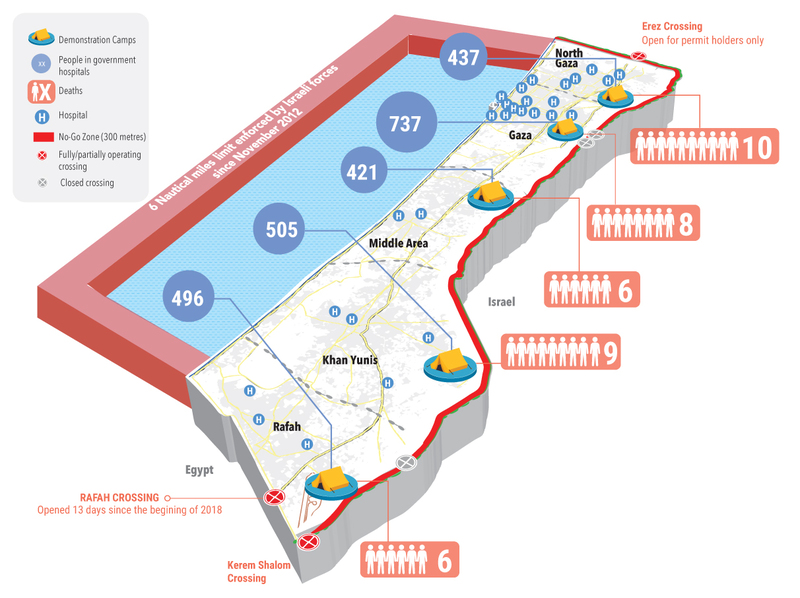 Since 30 March 2018, the Gaza Strip has witnessed a significant increase in Palestinian casualties in the context of mass demonstrations taking place along Israel’s perimeter fence with Gaza. The demonstrations have occurred as part of the ‘Great March of Return’, a series of mass protests, expected to continue up to 15 May. The large number of casualties among unarmed Palestinian demonstrators, including a high percentage of demonstrators hit by live ammunition, has raised concerns about excessive use of force by Israeli troops. Gaza's health sector is struggling to cope with the mass influx of casualties, due to years of blockade, internal divide and a chronic energy crisis, which have left essential services in Gaza barely able to function. Increase the number and presence of civil society partners to document possible human rights violations.